Trumpeter Swans have longer necks in proportion to their body lengths than do Tundras. There is no standard ratio formula, but this is a noticeable characteristic when the birds are either standing or swimming. It is not reliable in flight. Trumpeter: Wing span 84-96 in., Weight 21-30 lbs., Neck length 60 in. Tundra: Wing span 72-80 in., Weight 13-18 lbs., Neck length 52 in. Mute: Wing span 82-94 in., Weight 20-30 lbs., Neck length 57 in. Snow Goose: Wing span 36-44 in., Weight 4-6 lbs., Neck length 27 in. Photograph by Kurt Schwarz. Tundra Swan (left) and Trumpeter Swan (right). Did you see a swan and wonder what kind it is? The easiest and best way to know which swan species you are seeing is to listen to the voice. You can hear swan voices by clicking the links. Listen carefully, then compare the recording to the sound of the swan you are seeing in the wild. Trumpeter Swan calls are unmistakably trumpet bugle calls. They have been known to be heard from 2 miles away in mountain regions. 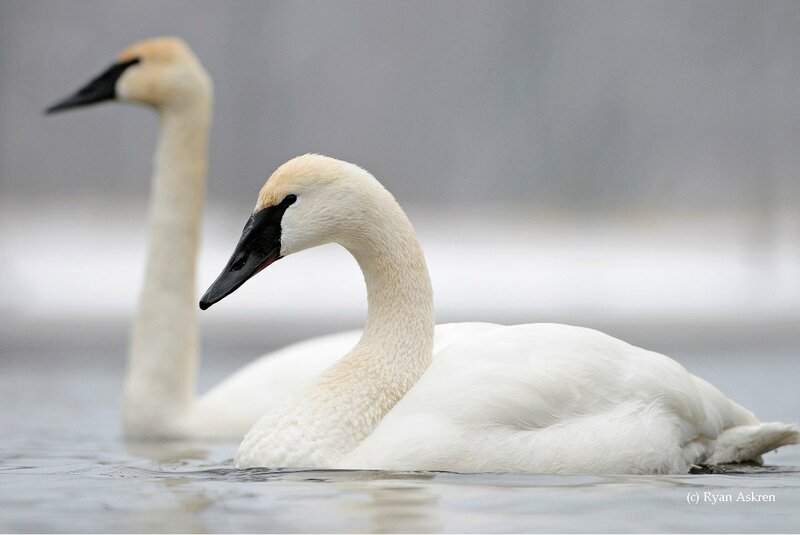 Tundra Swans, sometimes known as Whistling Swans due to its call, have calls that are much higher pitched with a different cadence. When there is a mixed group of swans, listen for their calls and you will be able to pinpoint each species. Resonant, sonorous, loud, low-pitched, bugle like call. 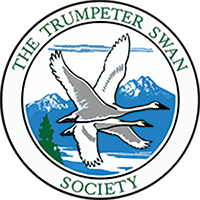 This video on our Facebook Page has the sights and sounds of Trumpeter Swans greeting a swan flying overhead; a swan dispute; a group response to the dispute; and other calls. High pitched often quavering oo-oo-oo, accentuated in the middle; or who, who-ho: woo-oo-woo; or who-who. Generally silent but not "mute". Hissing sounds are common and occasional snorting noises. What if you don't hear a call? Looking at the size of the swan and the bill color and bill shape is the next step in identifying the species of swan you are seeing. Here is a wonderful photograph by Jan Kitzing of Tundra Swan adults (white) in Missouri swimming next to a Trumpeter Swan cygnet(gray). Because the two species are swimming together, you can easily see the size difference between Trumpeter Swans and Tundra Swans, as well as the head and subtle bill difference. The gray Trumpeter Swan cygnet is considerably larger than the white Tundra Swan adults. The Trumpeter Swan cygnet has a straight black bill, with the black markings extending to the eye. The Tundra Swans usually have yellow markings on their bills. 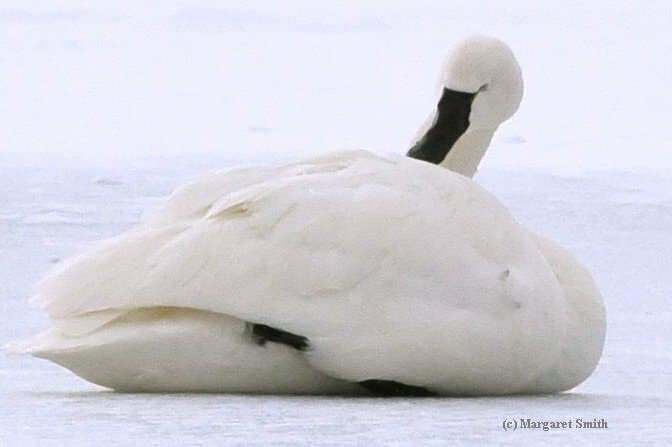 The Tundra Swan bill is slightly concave or spoon-shaped, but it can be difficult to tell the difference between the two species based on bill shape as the bill differences can be subtle to the untrained observer (and even the trained observer!). Often the Tundra Swan's eye looks somewhat separated from the bill. 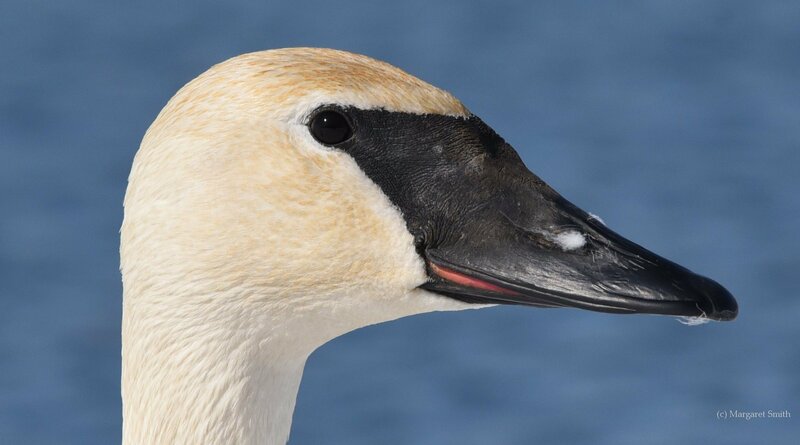 A Tundra Swan head shape is often more rounded than a Trumpeter Swan head shape. Telling the two species apart is not as easy to see if swans are far away in flight or on the water. In that case, listen for the call. 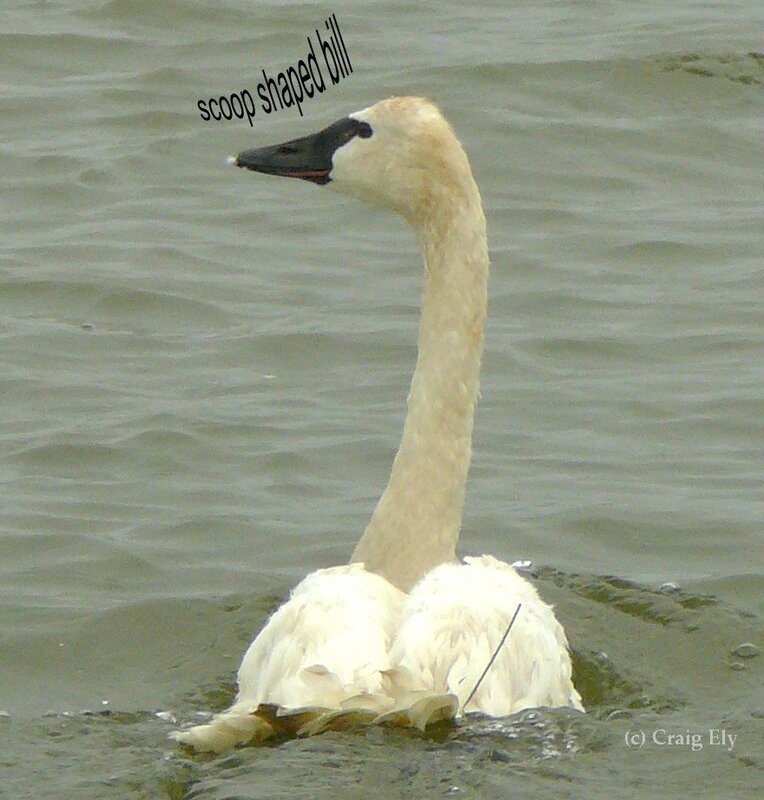 The Trumpeter Swan bill is heavy in proportion to its head with a straight profile. It has an angular head shape somewhat resembling canvasback duck. The eye is not distinct from bill. Trumpeter Swans have black bills with red border on lower mandible; the red border may also be present on some Tundras. The head of Trumpeter Swans is more flat and less rounded than a Tundra Swans. The white "fluff" on this Trumpeter Swan bill is feather down. The swan had been preening itself to distribute oil on its feathers for waterproofing. You can see the "lipstick red" mandible. The orange/brown staining on the head and neck is from tannin in theiron-rich water. Trumpeter Swans feed, "tip up" and search the bottom of rivers, lakes and wetlands for food. They are mostly vegetarians as adults. Their heads and necks spend a lot of time under water! This Trumpeter Swan is in display, rising out of the water to flap its wings several times. You can see the red mouth. Swans have no teeth. The mouth filters the water and food. It is the red mouth area that is also part of the "lipstick red" mandible that can be seen on Trumpeter Swans. You can see the black coloring from the bill up to and meeting the eyes. 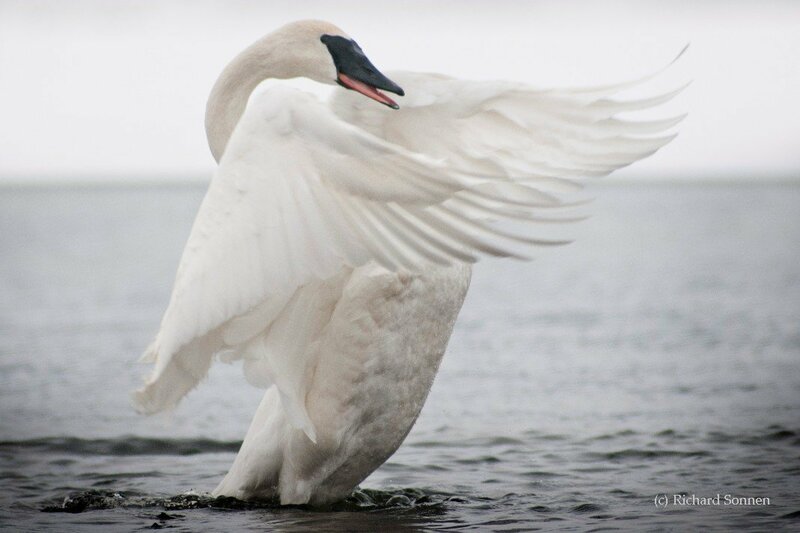 This Trumpeter Swan has the typical V-shape black marking between its eyes. The Tundra Swan bill is more dish-shaped in profile. The bill is smaller in proportion to the head compared to the Trumpeter. 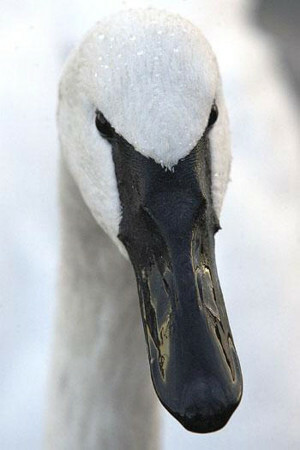 The Tundra Swan head is smoothly rounded; the eye is usually distinct from bill. 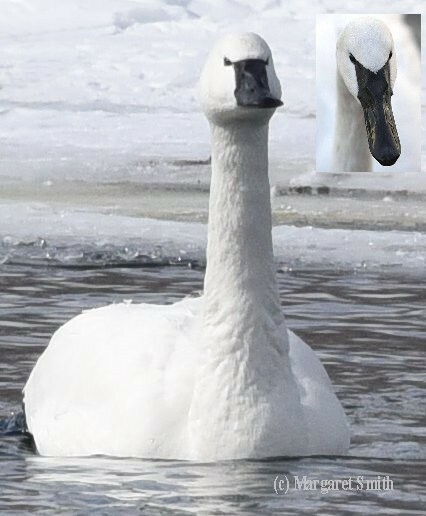 Looking at a Tundra Swan head-on, the shape of the black bill between the eyes is generally more U-shaped or spoon-shaped (Trumpeter Swans generally have a more V-shape- see photo above). The shape of the head profile may vary between individual birds. Tundra Swans especially have a wide range of head-bill shapes, some having very obvious concave bills, while others appear straighter. Look carefully at the eye area for any yellow on the lore and if the eye is distinct from the bill. 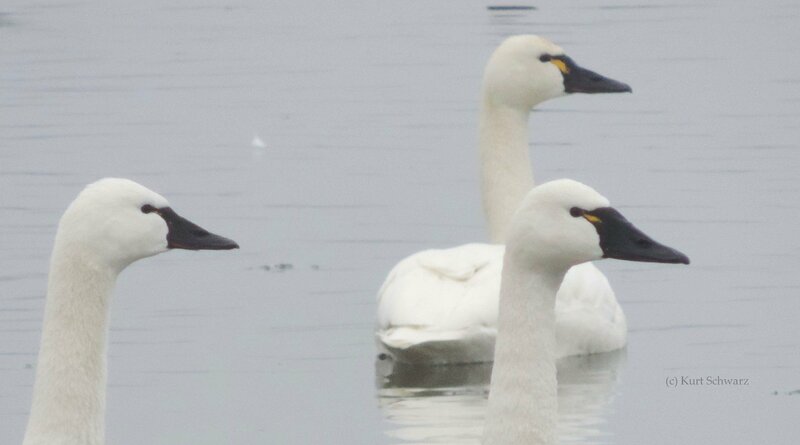 Tundra Swans have a black bill, usually with yellow spot of varying size in front of eye; this spot maybe absent on some Tundras. 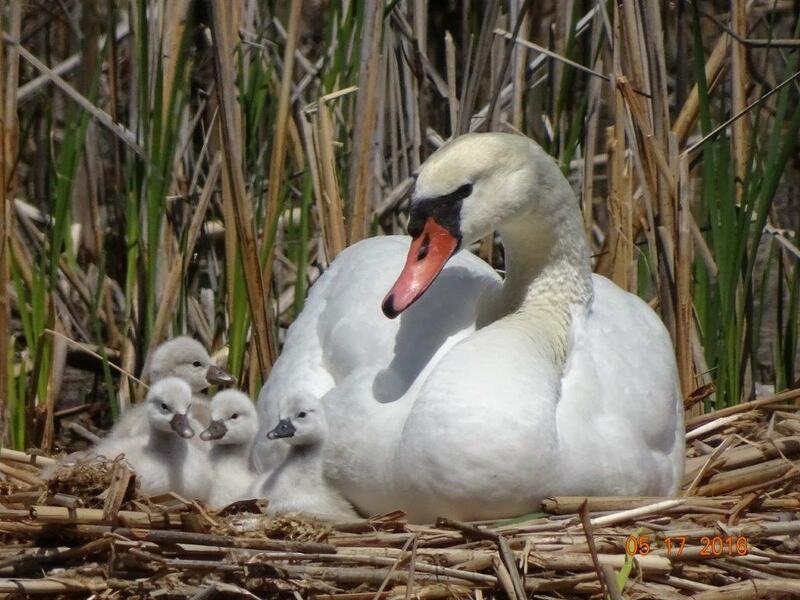 To add to the confusion, sometimes Trumpeter Swans have yellow markings on their bill, and sometimes Tundra Swans have all black bills! Note the rounded "U" or spoon-shape of the black coloring between the eyes. This more flattened curve contrasts with the sharper "V" shape of Trumpeter Swans. Photograph by Craig Ely. There are a variety of Tundra Swan bills shapes. Generally they are more scoop-shaped compared to Trumpeter Swans, but sometimes the curve of the bill is subtle. 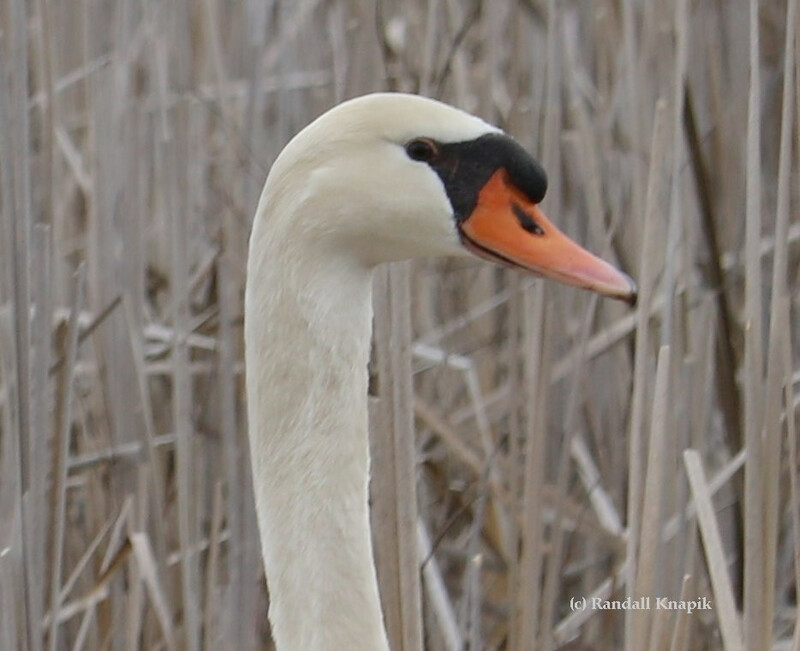 This swan is wearing a GPS antenna and is part of a Tundra Swan migration study. A Mute Swan's bill is orange with a black knob at the base near the eyes. A knob is clearly visible in both sexes but is more pronounced in adult males. Mute Swans have distinctive orange bills, and a large black "knob" between the eyes and bill. Male Mute Swans (above) have larger black "knobs" than females. Mute Swans are not native to North America. They are more aggressive than Trumpeter Swans. They are a protected species in England and are property of the monarch. The "knob" on the female swan is not as large as the male's. The cygnets have all black bills that will eventually turn orange and black. Did you see a gray swan? Gray swans are cygnets, less than a year old.